Metro stations are marked with -signs (Metro in Swedish is Tunnelbana). You can find the online trip planner at http://sl.se/. Exit through the north ticket hall (in the forward direction of the train if you arrive from Stockholm City) and turn to the right after the escalator. Cross the footbridge and pass straight through Kista Galleria shopping mall. On the other side of the Galleria, cross the footbridge and take the first left. The NOD building is at the end of this path. Use the entrance at #12. Street address is Nodhuset, Borgarfjordsgatan 12, Kista. Arlanda is the largest airport in the Stockholm region, with direct connections to major cities in Europe as well as several connections to North America. Arlanda is situated 60 km north of Stockholm. By taxi: the journey should take less than 30 minutes. Always ask for a fixed price (a reasonable price is 400 SEK). If you decide to take a taxi, note that there are separate queues for each taxi company – reputable companies are Taxi Stockholm, Taxi Kurir, and Taxi 020. The address to the NOD building is: Nodhuset, Borgarfjordsgatan 12, Kista. By commuter train: the journey takes about 30 minutes. Take the commuter train (pendeltåg in Swedish) from Arlanda airport in the direction of Stockholm central station, and get off the train at Helenelund train station. From there you can walk to the NOD building (about 15 minutes) or take the bus to Kista centrum. If you’re in Stockholm city then it is possible to take the commuter train from Stockholm central station (direction Märsta or Uppsala) to Helenelund. By airport bus: the journey takes about 45 minutes and takes you to Stockholm city terminal, which is right next to the central station. From there you can take the metro to Kista (see above). The journey costs 105 SEK. For more information please see http://www.flygbussarna.se/. 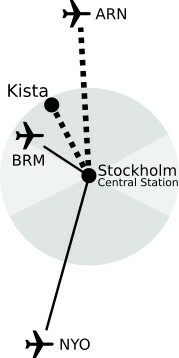 By express train: the journey takes 20 minutes and takes you to Stockholm central station. From there you can take the metro to Kista (see above). The journey costs 260 SEK for a one-way ticket, and 490 SEK for a return ticket. Usually there is a discount for buying multiple tickets. For more information please see https://www.arlandaexpress.se/. This airport is sometimes referred as Stockholm South. It is mostly served by low cost carriers. It is located approximately 120 km south of Stockholm, close to the town of Nyköping. Take the airport bus http://www.flygbussarna.se/ to Stockholm city terminal (the journey takes about 1h20) and then take the metro to Kista.